For those who want to commune with nature and spend a night or two out of doors, there are plenty of camping facilities throughout the Schuylkill River Greenways National Heritage Area. 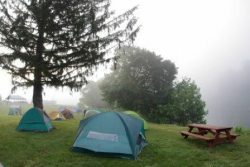 In this section you’ll find information about where you camp, camping safety and ethics, and resources you can contact for further information. Camping in the Schuylkill River Heritage Area is generally limited to State Parks and private campgrounds. There are also approved shelters along the Appalachian Trail. Currently there are no rustic camping facilities along the Schuylkill or its tributaries. If you are planning a multi-day paddling trip along the Schuylkill, we recommend that you contact individual municipalities near your projected stopping points to determine what overnight facilities are available. Take at least one companion with you on your trip if possible. This is especially important when camping in remote areas or along trails that are not part of a larger camping facility. Be knowledgeable about reservations and permits at the sites where you plan to stay. Do not camp in undesignated areas or on private property. Be sure to have all of the necessary equipment for your trip including rain gear, dry clothes, and enough food and water for the duration of your trip. Have a First Aid kit with you and readily available. Be sure to check the kit before leaving to make sure it is fully stocked. Check your site for hazards such as poison ivy, bees, rocks, unstable ground, glass, etc. Try to arrive at your campsite before dark to allow enough time for set up. Always boil water to be used for cooking or drinking or use a water purification system. Keep campfires to a minimum and make sure they are completely extinguished before leaving the site. Be mindful of wildlife in the area. There are bears, raccoons, and other animals in the Heritage Area that are attracted by the smell of food and garbage. Check yourself for deer and dog ticks frequently throughout your trip. Ticks like to hide in warm, moist parts of the body and may be difficult to locate. There are facilities for all types of camping throughout the heritage Area. The kind of equipment you’ll need will depend upon the type of camping you intend to do, the location you choose, and the facilities provide at each location. It is recommended that you talk to an outfitter or camping supply store for questions about specific equipment needs.